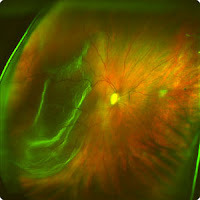 The Optomap Retinal Examination is currently available at the Bedford Eye Care Centre in Sunnyside Mall in Bedford, N.S. At the Bedford Eye Care Centre, we have found the Optomap Retinal Scanner to be invaluable in the detection and documentation of many eye and systemic diseases. I have personally found a number of pathologies that I would not have been able to see well enough without the assistance of this incredible technology. It also allows me to more accurately follow the progression of a disease or improvements after treatment. In addition, it’s wonderful to be able to educate the patient properly about their eye condition by showing them their image and we also email the images to specialists when making referrals.